The proclamation placing Boracay under state of calamity covers the world-famous island's three barangays: Manoc-Manoc, Balabag, and Yapak. MANILA, Philippines (Updated 8:06 p.m.) — Concerned residents of Boracay recently reported that a mountain located in a village in Boracay is being leveled amid the government’s closure of the island for rehabilitation. In a Facebook post of non-government social media travel site Tourism Philippines on Monday, a resident sent footage supposedly showing excavation work on a mountain in Barangay Yapak, Boracay. The footage showed a flattened area in what used to be a mountain. The description of the video indicated that the video was taken on May 11 and its location was between Eco-Village and way to Shangrila, Barangay Yapak. Tourism Philippines told Philstar.com that the sender of the video is a Boracay resident who wished to remain anonymous. Media access to Boracay has been restricted since the closure of the island. Other residents, who refused to be named, took to social media to complain and seek clarification on the leveling and clearing of the forest amid the island's closure. “I am witnessing four trucks and a backhoe, working from morning to dusk ripping down the mountain and carting it away,” a resident said. Costa Vista is a development project of Vista Land & Landscapes Inc., which is chaired by former Sen. Manny Villar. His wife, Sen. Cynthia Villar, is chair of the Senate Committee on Environment and Natural Resources, which earlier conducted a probe into Boracay's environmental problems. In an October 2016 report of The STAR, Costa Vista Boracay was described as a project that will include six residential towers, private villas, hotel, a pavilion with viewing deck, pool, convention center and a commercial quarter. In an email, Vista Land chief legal counsel Ma. Nalen Rosero said that "as early as February this year, we have slowed down our development works, and have accordingly reduced the number of equipment and workers in the area." 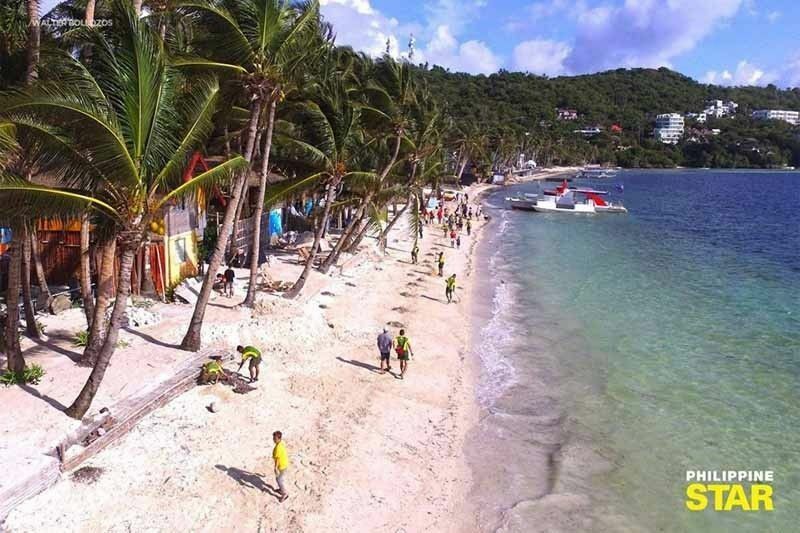 "At the outset, we wish to emphasize that we have complied with all applicable laws and regulations; and have obtained all requisite government permits and licenses, in connection with our development project in Boracay," Rosero stressed. "Significantly, the images appearing in the articles do not pertain to our project site," Rosero said. "The area subject of our development is a developed resort with existing facilities. Moreover, it is our policy to respect and preserve the natural topography of the land. To do so is not only structurally sound but more importantly, environmentally friendly," she also said. Philstar.com sought confirmation from Environment chief Roy Cimatu and Barangay Yapak Chairman Hector Casidsid on the reported leveling in the village but neither have responded. The Department of Environment and Natural Resources has reportedly already sent a team to verify the social media post. DENR Assistant Secretary Jonas Leones reportedly said the construction was for a subdivision but had been stopped a month ago. Cimatu was assigned by President Rodrigo Duterte to chair the inter-agency task force for Boracay rehabilitation. The world-famous destination has been closed to tourists pave way for its rehabilitation. The closure was implemented last April 26 and would last for six months. Duterte also placed Boracay under a state of calamity. It covers the three barangays on the world-famous island: Manoc-Manoc, Balabag, and Yapak.